He hasn’t spoken her name in fourteen years. She keeps a journal hidden in the back of her closet and permits herself to write about him once a year—on the anniversary of the first and only time they made love. 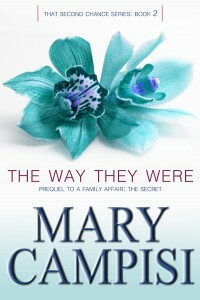 THE WAY THEY WERE is a story of love, forgiveness, and second chances. At eighteen, Rourke Flannigan and Kate Redmond dreamed of sharing the rest of their lives together until a family tragedy tore them apart. Kate has spent years trying to be a good wife and mother but once a year, she sheds these roles and writes a letter, (which she’ll never send), to the man who owns her heart. Rourke is a high profile, enigmatic Chicago developer who appears regularly in Money and People. He hasn’t spoken her name in fourteen years. But once a year, he permits himself to remember. When a subcontractor is killed on one of Rourke’s sites, he pays the widow a personal visit, never dreaming the widow will be Kate. As they embark on a cautious journey of rediscovery, one far greater than they could have imagined, secrets and lies threaten to destroy their new found closeness – forever. Thanks, Lauri! Actually, The Way They Were is out now. You can check the links on this site or just go to Amazon, B&N, i-books, or Smashwords. Thanks again for stopping by.